Born in Larne in 1805, into a family with strong Ulster-Scots Presbyterian roots, Sir Edward Coey was one of the generation of visionary businesmen who helped make Belfast one of the most prosperous manufacturing centres in the world during the industrial revolution of the 19th century. Coey started off as an apprentice butcher but his entrepreneurial flair quickly became evident and by the 1830s, in partnership with his brother James, he was the proprietor of the enormously successful 'Northern Shoe & Boot House' in the centre of Belfast. Coey soon tired of the trade, sold out and, for a time emigrated to America. There as his brother James later recalled, he "got a smell of the ham trade" and in 1841 came back to Belfast where he established a provisions and curing business, Coey & Co. Ltd, which operated from 21-29 Gamble Street in the docklands area of the city. Coey's pioneering American-style cured ham and bacon was an instant success and by 1846 additional premises had been acquired. As the company prospered it provided a lucrative foundation for a host of other entrepreneurial activities. Coey accumulated a portfolio of business and residential property in Belfast, London, Liverpool and in the United States. Coey for many years represented the St George's Ward in south Belfast as a councillor and later an Alderman of the city. Although a member of the influential Liberal Party, Coey opposed Gladstone's efforts to give Ireland Home Rule as being detrimental to Ireland's economic well being and its place within the British Empire. Nevertheless with the support of such local Liberal personalities as Thomas Gaffikin (1811-93) and the Catholic master baker Bernard 'Barney' Hughes (1808-78), Coey became the first and only Liberal Mayor of Belfast in 1861. The same year he was knighted for his public works, and in 1867 was appointed Deputy Lieutenant of County Antrim and High Sheriff for the prefecture. He was also a Borough Magistrate in Belfast, member of the Grand Jury and Belfast Harbour Commissioners and in July 1869, was one of the eight founding subscribers of the Northern Ireland Chamber of Commerce and Industry, an organisation that still survives. As his prosperity increased, Coey shared his great wealth with the less fortunate through an association with various Belfast charitable associations include the Belfast Charitable Society, Presbyterian Orphan Society, the Presbyterian Sabbath School. He was Patron of the Belfast Society for the Prevention of Cruelty to Animals and the Belfast Sailors Home in Corporation Street. 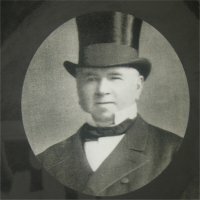 He was also a Patron of the Malone Protestant Reformatory, Lisburn Road, a life Governor of the Belfast Royal Hospital, then located in Frederick Street, as well as a Governor of the Belfast District Hospital for the Insane Poor (Lunatic Asylum), Falls Road, and Belfast Ophthalmic Hospital, the Eye and Ear Dispensary in Great Victoria Street. Membership of the Belfast Poor Law Union, which operated the city Workhouse, was another of his philanthropic interests. The most enduring testament to his extensive philanthropy is undoubtedly the Grammar School in his home town of Larne which he co-founded in 1886 with John Crawford, making an initial £1,000 endowment. Situated on the Lower Cairncastle Road, it occupies a beautiful location with stunning views across the town of Larne to the sea and the hills of Wigtownshire in Scotland beyond, the site secured at a rent of one shilling a year for ten thousand years. In 1855 he acquired Merville House from Major John Rowan JP DL of Garry and Ahoghill (c.1780-1855), who was the eldest brother of Sir Charles Rowan KCB (1783-1852), the joint founding Commissioner of the Metropolitan Police in London. Coey invested substantially in his new residence, which was originally built in 1799, and installed his Coat-of-Arms in a window at the head of the grand stairs, where it remains today. He died at Merville on 27 June 1887.